The player shows minor wear, but overall in GREAT condition. Works perfectly. Tested and working 100%. Player and original battery only. Creative zen Micro MP3 player (White) Buy As Is. Shipped with USPS First Class Package or small priority box. It does turn on. Has some music on it. Buy as is. Has not been reset. Creative Zen Micro. - Remote for dock. - Creative head phones. Tested and working. Cash on Collection. Creative ZEN Micro MP3 Player 5gb BB09C4JBO5Z6H. Condition is Used. Dispatched with Royal Mail 1st Class. Model: Zen Micro. Although we have tested the item and appears to be working, we may not be able to check every single function. This item is graded as Grade B. Grading definition. Compatible with: Zen 4GB / 8GB / 16GB / 32GB / Zen V / Zen V Plus / Zen Micro / Zen Neeon / Zen Muvo / Zen Stone / Zen Stone Plus. 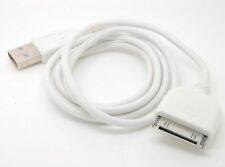 generic usb&Charging cable for greative zen mp3/. 1 X USB Data Cable.